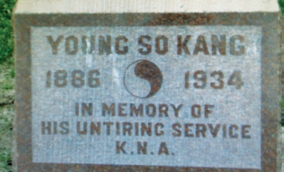 Kang, Young-so (Second Son): He had a big dream for the Korean independence movement. He came to Hawaii on May 29, 1905 when he was 20 years old and lived there for six years. Young-so is called “a towering tree” in the Korean independence movement in the United States. When Korean King Gojong was abdicated in his dispatching Hague emissary, Korea lost its sovereignty to Japan. He worked hard to establish two organizations like Hap Sung and Gong-Lip to give rise to the Korean National Association in 1909. He served two presidents for the Association as he joined Hung Sa Dahn when Dosan Ahn Chang Ho founded it in May 1913. He was the Second to join Hung Sa However, his efforts to unite two organizations of Hawaii, the Korean National Association and the Gong Lip Hyup Hoe did not materialize. Before his immigration to America, Young-so learned accounting at his elementary school. While he was in Hawaii, he was baptized to be a godly Christian. When he was elected the President of Korean National Association, his top priority was to file a parole of Chang, In-hwan from prison. He was active in San Francisco while serving Hung Sa Dahn and Korean National Association toward the end of 1921. He collected Korean independence funds while serving various civic organizations to which service he was awarded by the Korean National Association in 1922. The donation from Koreans was forwarded to Provisional Government in Shanghai. He relocated to Chicago where he operated a restaurant by providing financial support on Hung Sa Dahn and Korean churches as well. In 2011, the South Korean government posthumously recognized him with the Order of Merit of National Foundation/Independence Award for his cornerstone role of supporting various Korean societies and independence movement until he passed away on August 26, 1934. 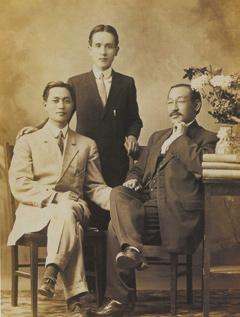 From left: Kang, Young-so, Hong, Earn and Choi, Jeong-ik: 1910 photo taken in San Francisco. North America Student Union Conference in Chicago: 6/11 – 13, 1924. Kang, Young-so is standing 7th from the left in the second row and his wife is seated eighth from the left in the front row. 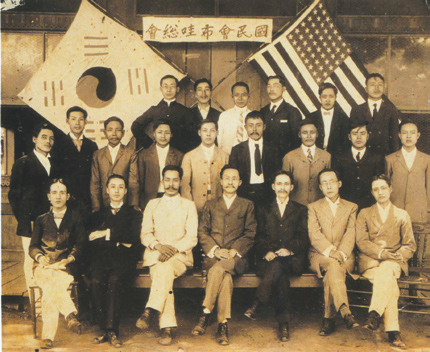 Korean National Association founding members in Hawaii: Kang, Young-so is seated 1st from right in the front row. 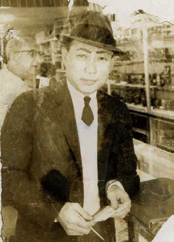 U.S. citizen Kang, O-san, son of Kang, Young-so, served as a Director of U.S. Information Service in 1947 in Korea. 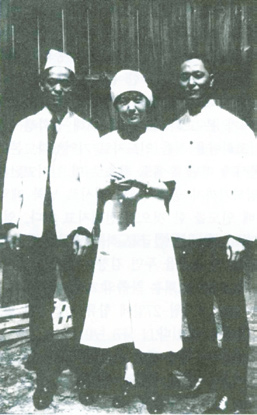 Kang, Young-so (far right) with his wife and his younger brother Kang, Young-sang; taken behind their cafeteria during the break in 1924.